Bridge maintenance supervisor Jimi Differ holds a piece of ice that was on one of the support cables of the Penobscot Narrows Bridge on Monday. 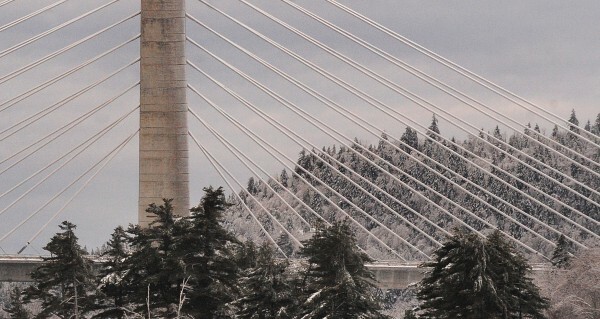 The Maine Department of Transportation closed the Penobscot Narrows Bridge Monday due to large chunks of ice falling from the support cable onto the bridge deck. 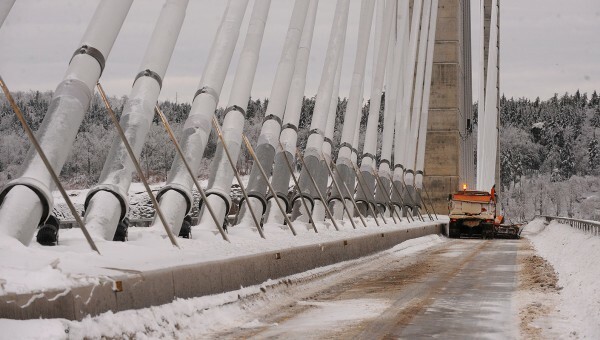 The Maine Department of Transportation closed the Penobscot Narrows Bridge on Monday due to large chunks of ice falling from the support cable onto the bridge deck. A snowplow clears the Penobscot Narrows Bridge deck of snow and ice debris Monday. Pieces of ice were reported to be anywhere from 1 to 6 inches thick and possibly weigh several hundred pounds before they shatter on the bridge deck. 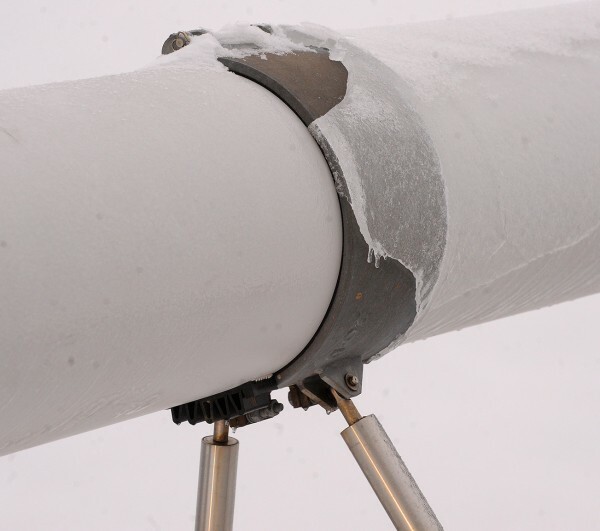 A thick coat of ice is visible on the Penobscot Narrows Bridge's first support cable on the Verona Island side Monday. 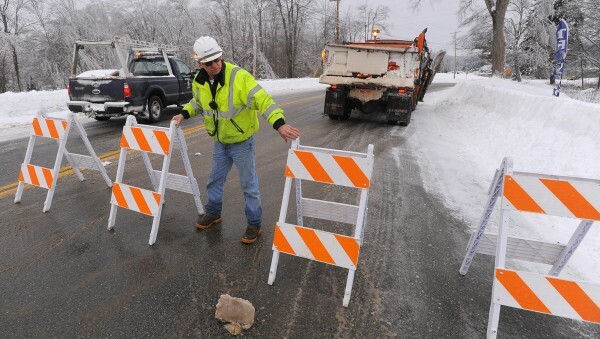 Bridge maintenance supervisor Jimi Differ puts a road block out near the Verona Island side of the Penobscot Narrows Bridge on Monday. VERONA ISLAND, Maine — In nine years, Charlie Bickford never had been late for work. The 60-year-old Belfast resident has been the host of the Woodstock Nation Radio show at WERU, the community radio station based in Orland, he said Monday. But as a result of an ice storm last week and the subsequent closure of the Penobscot Narrows Bridge on Sunday and into Monday night, he missed all of one of his noon shows and more than half of another. The bridge was closed Sunday morning because, as temperatures rose, ice that had been stuck to the cables of the bridge from the recent storm began to melt and fall onto the roadway. The closest alternate route to cross the Penobscot River is 20 miles away in Bangor, adding 40 miles to some motorists’ commutes. Maine Department of Transportation spokesman Ted Talbot said Monday evening that the bridge will reopen to traffic between 8 and 9 p.m. Monday and that it will be temporarily closed again over the weekend for renewed ice removal efforts. He did not have a time frame for this weekend’s work. Talbot said a crane was brought to the bridge late Monday afternoon to knock ice off the cables but that the attempt failed. At least four cars reportedly were damaged by falling chunks of ice Sunday, though no one was injured. A Ford SUV was listed as a total loss with damage to the roof, hood, windshield and rear window, according to a prepared statement from Hancock County Sheriff’s Office officials. Around 11:20 a.m. Sunday, Bickford approached the bridge in his car and saw emergency vehicles. When he asked an official what was going on, the man pointed up. 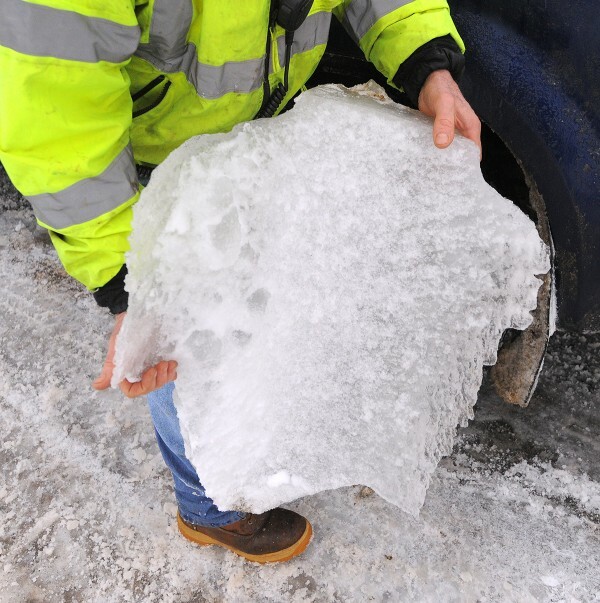 “I looked up and a great big chunk of ice just fell and burst like a bomb on the roadway,” he said. As a result, Bickford had to drive to Bangor and then back downriver through Orrington to get to the station in Orland, turning his regularly 35-minute commute into an hour-and-45-minute drive. “We continue to consult with industry experts from the public and private sector,” Talbot said of the MDOT’s efforts to address the ice. He added that they are speaking with experts who handle bridges in other locations, including Boston, the location of the Leonard P. Zakim Bunker Hill Memorial Bridge. Like the Penobscot Narrows Bridge, the Zakim bridge is a cable-stayed bridge, meaning the deck of the bridge, where the road rests, is held up by cables which are attached directly to the towers of the bridge. In 2005, when the Penobscot Narrows Bridge was under construction, the Zakim bridge had to be closed for two hours because ice was falling off the cables into the roadway, according to news reports from the time. At least one car was damaged. With that design, he said at the time, any ice that builds up and drops from the stays can drop onto a car. On the Penobscot Narrows Bridge, the cables run from central towers to anchors located in a median strip along the center of the bridge’s deck. “If ice should build up there — as I suppose it probably will — it would drop directly down and onto the median … in the middle of the bridge,” Doe said at the time. That was not the case Sunday, when car-sized pieces of ice fell onto the roadway, according to witnesses. “It’s such a unique event that trying to design a bridge so ice won’t fall off it isn’t necessarily something that one could engineer,” said Talbot. Bill Davids, a University of Maine engineering professor, echoed that sentiment. The Port Mann Bridge, near Vancouver, is installing cable sweepers, which will move up and down the cables to prevent ice buildup. The Penobscot Narrows Bridge carries Routes 1 and 3 from Verona Island to Prospect. Construction on the bridge began in 2004 after an inspection of the Waldo-Hancock Bridge, which originally carried Routes 1 and 3 across the Penobscot River, revealed that the cables on the bridge were significantly deteriorating and that some cable strands were broken. The MDOT immediately prohibited load-bearing trucks from crossing the bridge. Construction of the new bridge was completed in 2006. For updates on the Penoscot Narrows Bridge, visit maine.gov/mdot. Bangor Daily News writer Dawn Gagnon contributed to this report.